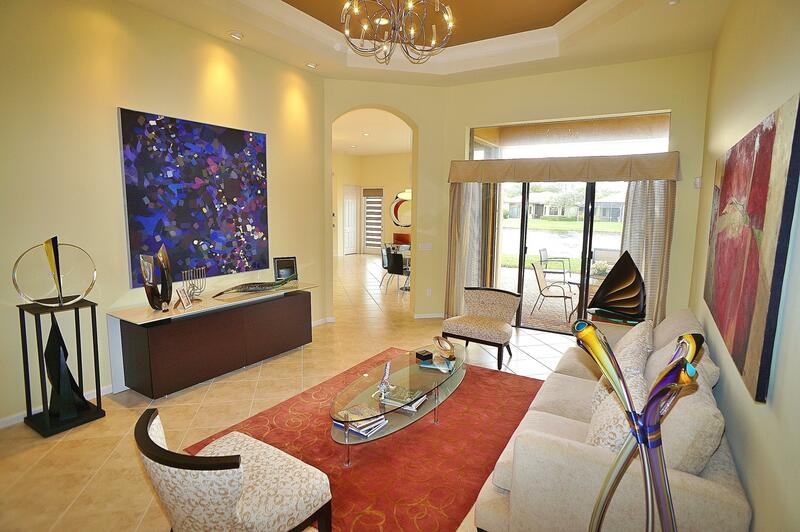 This Contemporary, rarely available Brunello Model takes full advantage of the desirable lake views. Enjoy outdoor living in your 32 x 25 extended paver patio, perfect for Al Fresco Dining. Imagine relaxing around a firepit after a day of tennis with your new Tivoli Lakes friends; this is what Florida Living is all about. You enter thru a welcoming courtyard with double doors that lead to an impressive open layout offering high volume coffered ceilings, & plenty of glass sliders, bringing the outdoors in. The bright rich accent colors enhance the high-end dramatic lighting thru-out. This move-in ready home is totally in-trend with clean lines & tasteful finishes. This split plan features 3 bdrms plus den off master & both a living room & family room...which is great for entertaining.